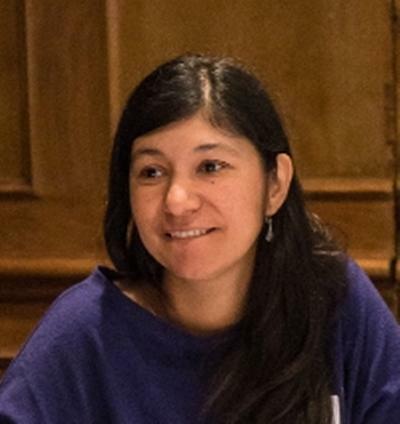 Dr Adriana Patiño-Santos is an Associate Professor in Modern Languages and Linguistics at the University of Southampton. I hold a PhD in Linguistics (Sociolinguistic ethnography) from the Universidad Autónoma de Madrid, Spain, an MA in Hispanic Linguistics from the Instituto Caro y Cuervo, Bogotá, Colombia and an MA in Linguistics (Discourse Analysis) from the Universidad Autónoma de Madrid. I have been a member of the Modern Languages and Linguistics at Southampton since 2012. Prior to this I lived and worked in Madrid and Barcelona, Spain, where I taught and researched at the Universidad Autónoma de Madrid, the Universidad Autónoma de Barcelona, the Universitat Pompeu Fabra de Barcelona and the Universitat Oberta de Catalunya, for over ten years. Since 2014 I have co-ordinated the Distance PhD programme run by the University of Southampton in collaboration with the British Council in Mexico. I teach modules on Cultural Studies in Contemporary Spain, Multilingualism, Language and Society and on Research Methods in Applied Linguistics. My research on multilingualism, social interaction and institutions has been published internationally in various leading journals and in edited collections, such as handbooks and other volumes on sociolinguistics. I have co-edited Special Issues for Spanish in Context (2012) and the International Journal of Sociology of Language (2018). I have expertise in sociolinguistic ethnography, language socialisation, narrative inquiry and multilingualism. I have concentrated on the social processes that are produced in daily-life encounters by focusing on the intersection between language, ideology and identity in institutional settings. Since 2006, I have been a member of two research groups in Barcelona (GREIP/UAB and GREILI/UPF), and more recently the group CIEN/UAB. September 2017-March 2018. “Language socialisation processes through minority media: the case of Latin Americans in the UK”. Patino-Santos, A. (2017). Trapped in a moral order: moral identity, positioning and reflexivity in stories of confrontation among Latin American teenage school girls in Madrid. AILA Review, 29(1), 1-37. Patino-Santos, A., Pérez-Milans, M., & Relano-Pastor, A. M. (Accepted/In press). ‘We don't do anything’: analyzing the construction of legitimate knowledge in multilingual schools. Pedagogies: An International Journal, 1-32. Pérez-Milans, M., & Patino-Santos, A. (Accepted/In press). Language education and institutional change in a Madrid multilingual school. International Journal of Multilingualism, 11(4). Patino, A. (2009). Narrando el conflicto: alumnado de origen inmigrante en un centro escolar de Madrid. Discurso y Sociedad, 3(1), 119-149. Escobar-Urmeneta, C., Evnitskaia, N., Moore, E., & Patino-Santos, A. (Eds.) (2011). Aicle-Clil-Emile Educació Plurilingüe: Experiencias, Research & Politiques. Servei de Publicacions UAB. Patino, A. (2017). Producing knowledge about plurilingualism with young students: a challenge for collaborative ethnography. In E. Moore, & M. Dooly (Eds. ), Qualitative approaches to research on plurilingual education (pp. 129-149). Dublin, Ireland/Voillans, France: Research-publishing.net. Patino-Santos, A. (Accepted/In press). Etnografía y sociolingüística. In J. Gutiérrez-Rexach (Ed. ), Enciclopedia de Lingüística Hispánica Abingdon, GB: Routledge. Patino-Santos, A. (2015). On Being a Latin American in La Sagrada Familia: the Negotiation of Identities and the Construction of Authenticity. In R. Márquez Reiter, & L. Martín Rojo (Eds. ), A Sociolinguistics of Diaspora: Latino Practices, Identities and Ideologies (pp. 102-121). (Routledge Critical Studies in Multilingualism). Abingdon, GB: Routledge. Trenchs-Parera, M., & Patino-Santos, A. (2013). Language attitudes of Latin-American newcomers in three secondary school reception classes in Catalonia. In J. Arnau (Ed. ), Reviving Catalan at School: Challenges and Instructional Approaches (pp. 49-71). Multilingual Matters - Institut d'Estudis Catalans. Borràs, E., Moore, E., Nussbaum, L., & Patino-Santos, A. (2012). Emergence de modes plurilingues dans des cours universitaires en L2. In Interactions Cosmopolites: L'Organisation de la Participation Plurilingue Editions Lambert Lucas:. Patino-Santos, A., & Vallejo Rubinstein, C. (2011). Dealing with multiculturalism in the Spanish classroom: from global to local challenges and opportunities. In Cultural Diversity in the Classroom: a European Comparison (pp. 145-162). VS Verlag. Patiño-Santos, A., & Martín Rojo, L. (2007). Las bandas juveniles y las estrategias discursivas de crimininalización [Youth gangs and the discursive strategies of criminalisation]. In Discurso Periodístico y Procesos Migratorios [The Discourse of Journalism and Migratory Processes] (pp. 81-116). Gak@a Liburuak. Patino-Santos, A. (2007). Somos Mayoría: extraños en las aulas [ We are the majority: strangers in the classroom]. In Voces del Aula [Voices from the classroom] (pp. 179-215). Creade, MEC. Pérez-Milans, M., & Patiño-Santos, A. (2013). Language education and institutional change in a Madrid multilingual school. (Tilburg Papers in Cultural Studies; No. 85). Tilburg, NL: Tilburg University. My teaching interests include issues in contemporary Spain such as current mobility (migration flows to and from Spain), the social consequences of the current economic crisis and the country's contemporary media and journalism. At the same time, I am also enthusiastic about sociolinguistics, multilingualism, intercultural communication and intercultural education. I particularly welcome postgraduate students interested in these and related topics for supervision work.